This poetic memoir uses a simple interface to involve the reader in the unfolding of the text, deepening the connection with the material. 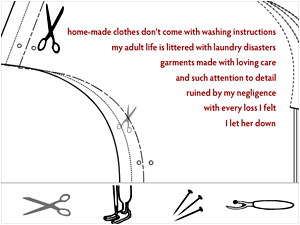 The memory of her mother’s sewing, their relationship, the clothes her mother made for her, and how those clothes were ways of shaping her all come across strongly in the narrative. The tensions between a girl growing up to adulthood and the conflicting impulses of strengthening and severing family ties is represented by the tools— sewing machine and pins versus seam ripper and scissors. This work is a great example of how a well crafted interface can truly enhance a narrative and poetic experience.